Aubrey is the colorful girl behind A Daily Obsession. 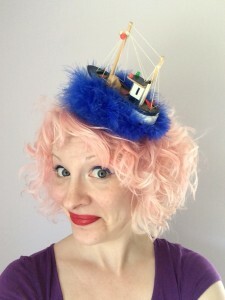 Armed with vintage doodads, felt, and glitter, she makes kitschy mini hats and novelty fascinators while drinking coffee and listening to slightly nerdy podcasts (or 80s synth pop). Need to wear a dirty martini on your head complete with olives? Maybe a fishbowl with a grumpy goldfish? Perhaps you were looking for a flamingo fascinator, or a disco ball, or a donut? From the slightly ordinary to the totally unexpected, Aubrey has your head covered.